Anomalobuthus krivochatskyi Teruel, Kovarik & Fet, 2018 (Central Uzbekistan and extreme southern Kazakhstan). Anomalobuthus lowei Teruel, Kovarik & Fet, 2018 (Southeastern Kazakhstan). Anomalobuthus pavlovskyi Teruel, Kovarik & Fet, 2018 (South-central Kazakhstan and extreme northern Turkmenistan). The genus Psammobuthus Birula, 1911 is synonymized with Anomalobuthus and its only species is transfered to the latter genus. The article presents an updated identification key for the genus. We revise the Central Asian endemic genus Anomalobuthus Kraepelin, 1900, which was considered monotypic for more than 100 years until the recent addition of a second species from Iran (Teruel et al., 2014). 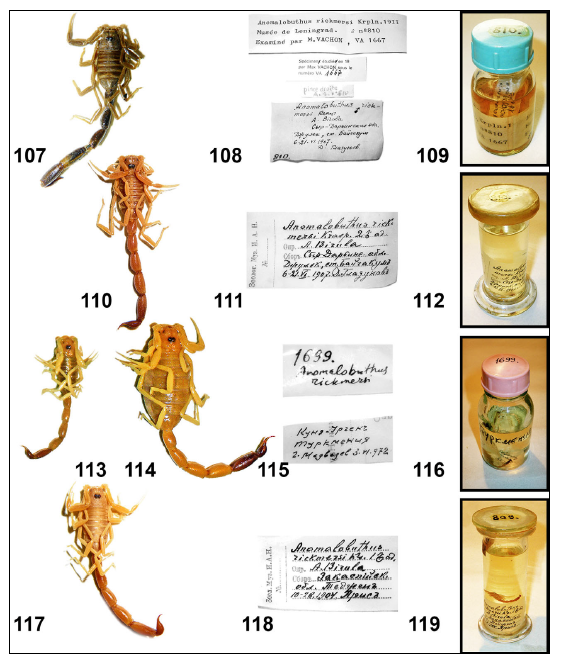 We redefine the generic diagnosis of Anomalobuthus and reveal that it is composed of no less than six species, three of which are described as new: A. krivochatskyi, sp. n. (central Uzbekistan and extreme southern Kazakhstan), A. lowei, sp. n. (southeastern Kazakhstan), and A. pavlovskyi, sp. n. (south-central Kazakhstan and extreme northern Turkmenistan). The monotypic genus Psammobuthus Birula, 1911 (described from the Ferghana Valley at the border of Uzbekistan and Tajikistan) is synonymized under Anomalobuthus; its single species is transferred as Anomalobuthus zarudnyi (Birula, 1911), comb. 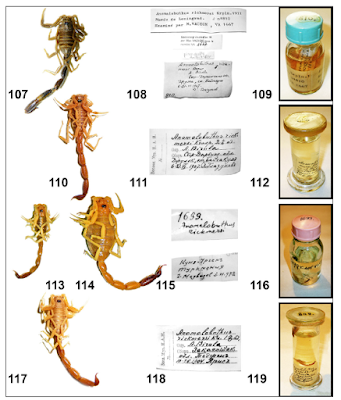 n. We also clarify the type locality of the type species A. rickmersi Kraepelin, 1900, from accurate data published by its collector Rickmer Rickmers (1913) but overlooked since its very original description: it is Baljuvon in Tajikistan. Occurrence of A. rickmersi in southern and southeastern Turkmenistan is confirmed. All available species are fully illustrated with color photos of habitus and morphologically diagnostic characters, and a key covering all six recognized species of Anomalobuthus is included. Thanks to Rolando Teruel for informing me about their article!